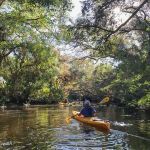 Ask fellow campers about "Koreshan State Historic Site" and nearby attractions. We spent 4 nights here. 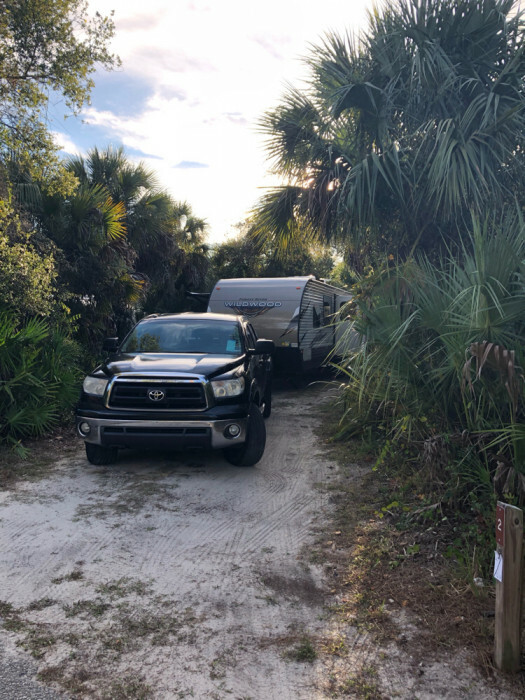 Found the campground area to be generally overgrown, sites were closely spaced and we needed 4 wheel drive to get into the site's loose sand. The positives were the nearness of several beaches and the historic area at the park. We had good Verizon service and great OTA tv. We would camp here again if we could get a different site. 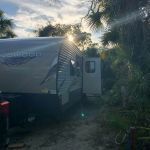 We camped at Koreshan State Historic Site in a Travel Trailer. Visit Lovers Key State Park, it's only $8 to get in and a great spot for shelling. Nice trail along the River to the historical spot and also good conditions for kids to Canoe and Kajak. We camped at Koreshan State Historic Site in a Motorhome. Check in was a bit tedious and we could hear quite a bit of traffic but would stay here again in a minute despite. Knowledgeable staff and beautiful grounds / hiking. Canoe/kayak (rentals available). Fire pit for s’mores and grilling. Learn some history along the way with a tour of the Koreshan commune - very interesting if you enjoy learning about other people’s culture. 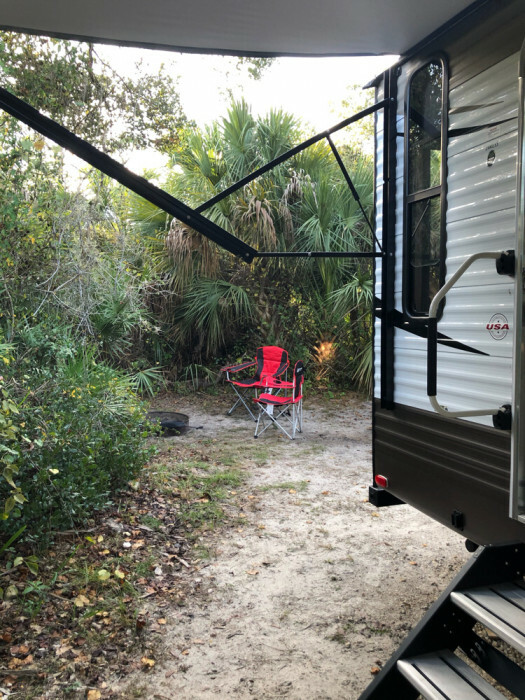 We camped at Koreshan State Historic Site in a Travel Trailer. Very nice small campground with some easy trails and an interesting park along a river. You can rent kayaks. Convenient location. Very natural setting and good spacing. Might be challenging for really large rigs. Bathrooms and showers were fairly clean and could use some updating. Site was not level but doable with levelers. 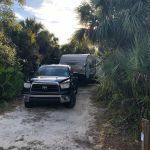 We camped at Koreshan State Historic Site in a Travel Trailer. Very friendly staff. Lots of vegetation to provide privacy at site. Park is gated at night to provide security. Easy to leave after hours with an access code for re-entry. There is a river at the campground with nice trails. They have a farmers market every Sunday. Some old historic building on site as part of the park. We camped at Koreshan State Historic Site in a Motorhome. Another very nice Florida State Park. My site was reasonably private with what looks like a fairly new electrical post (30 amp for me), water spigot, picnic table, and a fire ring. I drive a class B camper van without slides. A larger RV would find this a pretty tight space. This was a level site with a dirt surface. Because of recent rains, it was slightly muddy but I think it drains pretty quickly. A layer of crushed rock would have helped. The highlight of this park is the Historic Site donated to the state by the Koreshans. I took a very interesting self-guided tour which I highly recommend. Due to an impending tropical storm, I cut my visit short, but I would return again under better weather conditions. We camped at Koreshan State Historic Site in a Motorhome. This park is very close to restaurants, shopping, beaches, and tourist sites. It may be the cheapest camping option in the area. We chose this park as it was close to friends. Good price for this part of Florida. It was tight maneuvering the loop to get into our site (#50 - listed as 34' max but we got into it with our 36' MH - had to park car sideways in front of it). Best for smaller rigs or tent campers. The CG is VERY primitive/rustic with a lot of dead and overgrown shrubs and trees. Sites are very close together, separated by underbrush and we did hear noise from our neighbors later into the night, even with windows shut and AC on. It was very warm while we were there and I was concerned that we would encounter snakes or other critters while out walking our dog. We did hear what sounded like a large animal in the underbrush while walking at night so headed in the other direction. This park is a bit too rustic for our taste- we would probably not stay here again. There is kayak rental available as well as a boat launch area. Likely good for family fun. We camped at Koreshan State Historic Site in a Motorhome. Kayaking, picnic, wildlife watching, Kreshan settlement tours. Not far to beaches or shopping. This is a nice park in a great location. The site was long enough to back in the rv and towed trailer. The historical village is very interesting. We really enjoyed it. It is a shame the FL state parks don't have sewer hook ups. We camped at Koreshan State Historic Site in a Motorhome. We were told it has been recently updated - bathrooms were older but well cared for. The sites were well maintained. Our site was long but a bit narrow because of a big tree in the spot, had many low branches & upon leaving, low branches could not be avoided. We would go back in a New York minute! Loved how secluded you feel but had grocery & restaurants within 5 minutes! We camped at Koreshan State Historic Site in a Travel Trailer. The bamboo forest on site is a must walk - from the campground to the settlement is the prettiest of walks & the staff really maintains it well. The docents at the settlement itself are so informed & our son sat and chatted and asked questions for at least 10 minutes per house. 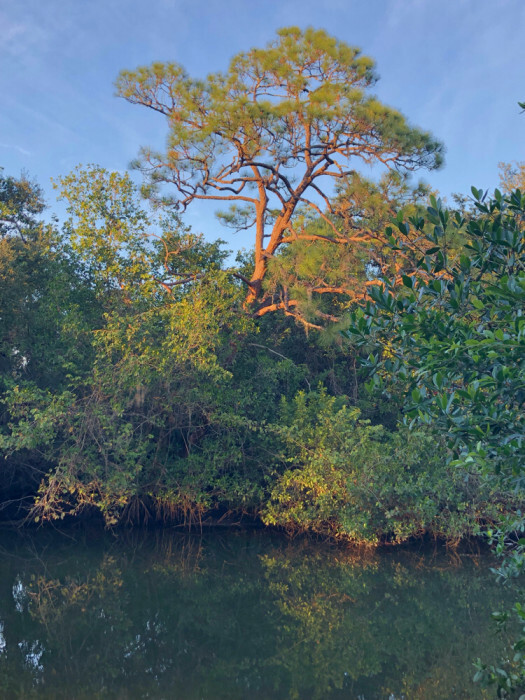 Visit the Audubon Corkscrew Swamp Sanctuary & the Rookery Bay National Estuary - they are each about 30 minutes away But why we come to this area of Florida!!! Since the last review in Jan. 2016 Koreshan has gone thru some updates. There is new water and electric service on all the sites and it is at the front of the sites. Extra water hose may be needed to make your connection, ours was fine. Vegetation has been cut back to make the sites a bit more wider. We stayed with some friends in their motor home which had no slides. I will be bringing my 30ft TT in March and it has a slide on both sides. As I walked around checking out sites, I am confident if you have a slide on each side, you will have no difficulty using them. The CG is very dark at night so be sure you have plenty of lights. Restrooms and showers were clean and roomy. Looking forward to being at Koreshan again in March. We camped at Koreshan State Historic Site in a Motorhome. CG is off of US41 and Corkscrew Rd. Plenty of shopping and dining in any direction. Good screening between site so not for big rigs unless you are OK getting paint scratched & not using slides. Sites deep & narrow. 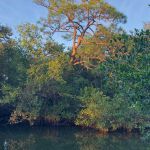 Paradise for kayakers; less than 1/4 mile to launch on Estero River then 4.5 miles to Estero Bay & Gulf of Mexico. Campground well back from US41 so minimal traffic noise. Delightful overall. We camped at Koreshan State Historic Site in a Motorhome. Doug's Seafood is the bomb! 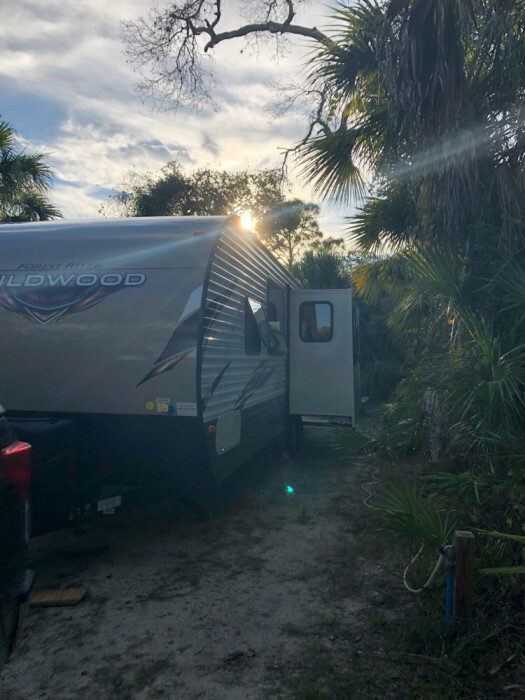 We were excited when we found this campground because southwest Florida is jammed with concrete, overcrowded cities of motorhomes and this was like stepping back in time. It is wooded and rustic. The sites are very private but the foliage providing the privacy also makes the sites tight. There were some bugs but we were in the middle of a jungle setting so if you can't take a few bugs, stay out of Florida, or don't camp for that matter! Stay in a hotel. The most fun of this campground is the fact that when you drive out you are surrounded by shopping and restaurants. We loved the juxtaposition of it all! We will probably return if we come back to this area. We camped at Koreshan State Historic Site in a Motorhome. We found this campground to be just right for our needs. 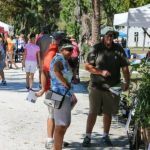 We have been visiting southwest Florida for years and last visit we came just for the museum but saw the campground and decided to give it a try this year. It is older and may not be everybody's cup of tea but we enjoyed our stay very much. The site was private because of the foliage and the grounds were clean. The area has grown so much in the past few years so it is a nice balance to stay in a rustic setting but be within minutes of shopping and great restaurants. Jeff's Chinese in the plaza across the street was very good. We camped at Koreshan State Historic Site in a Travel Trailer. I am so sorry to have to give this campground such a low rating, but there is a big problem. When we arrived in the early afternoon and hooked up, the voltage was 117 amps, so all seemed well. We turned on our air conditioner and went for a bike ride. When we returned another camper had pulled in next to us and was running the AC. Our electrical management system had shut down our coach for low voltage. I looked and the voltage was going down as low as 100 volts. That is far too low to run modern appliances. I went up to the front desk and was told that it was an old system and that was just the way it is. When I asked about a refund, she said probably not and that the park manager was not available. On the way back to the RV I came across a maintenance person. He came by and decided that changing out the plug might help. He was very nice, but changing the plug had no effect. We backed without air conditioning. Finally, after dark, the voltage went up enough that we could turn on the power but could still not run the AC without having the voltage go too low. So, we were very glad we had made only one nights reservation. All of the positives noted by other reviewers are spot on. However, we would not stay here again unless they upgrade their electrical system. I would also note that I think it would be very difficult to get a big rig into most sites. We are only 27 feet long and it was tight. We camped at Koreshan State Historic Site in a Motorhome. This is a rustic park, but there is so much to offer in the surrounding area that any possible inadequacies are made up for by the conveniences nearby. It was rainy and hot, but we just went shopping and sightseeing during the days and enjoyed the nights in the campground. Within a few minutes you have every restaurant you could want and high end shopping at Coconut Point. Drive into Bonita Springs for Gulf access, it is much nicer than heading over to Ft Myers Beach. We enjoyed our stay and will definitely return. 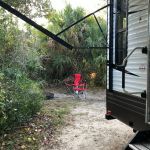 We camped at Koreshan State Historic Site in a Travel Trailer. 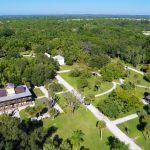 Are you affiliated with Koreshan State Historic Site ?